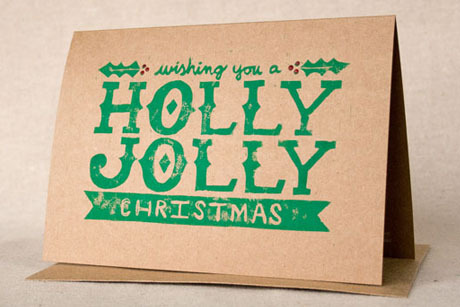 i love the Christmas holiday season… but I don’t like to jump on that band-wagon till the day after Thanksgiving. 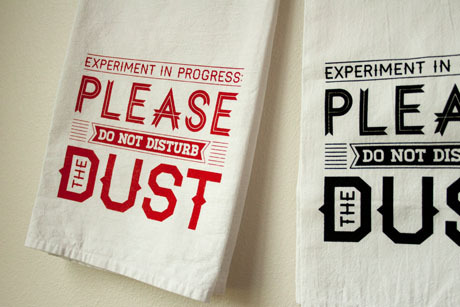 It is difficult to keep the holidays at bay when you are working on projects that are specifically for holiday season. 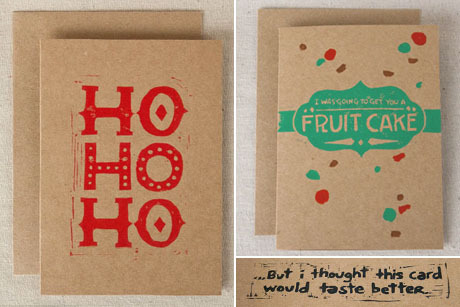 This last month, I decided to put together a few Christmas/Holiday cards. 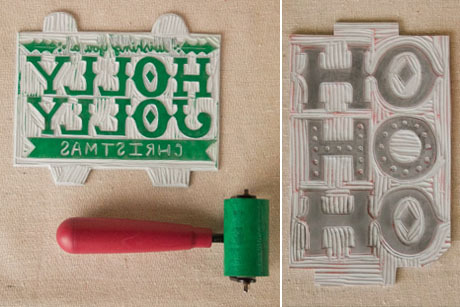 These are the few I got done: “Wishing You A Holly Jolly Christmas” and “HO HO HO” (which are both blank in the inside), and “I Was Going To Get You A Fruit Cake… (inside) But I Thought This Card Would Taste Better.” Each of the cards started as drawings in my sketchbook and then I made them into hand-carved linocuts that were stamped on kraft cards. 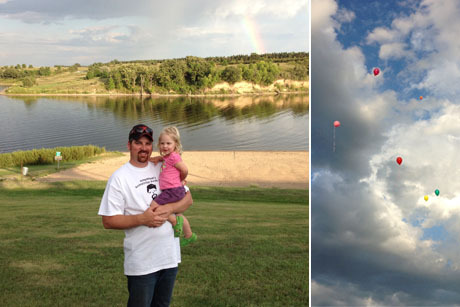 we headed to Lisbon, ND this past weekend to remember a great friend who passed away last year. His wife and a few of his friends had put together a weekend of camping, games, and reminiscing. We miss you, Bigrigger! i got to spend a couple of days with my sister this weekend at the lake before she officially moves to Portland, Oregon. 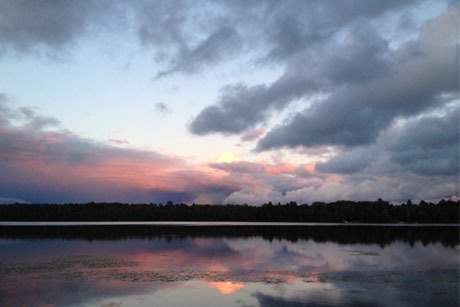 Witnessed this colorful sunset, the clouds were low due-to a cold front. It is crazy to think that cool temperatures are just around the corner. 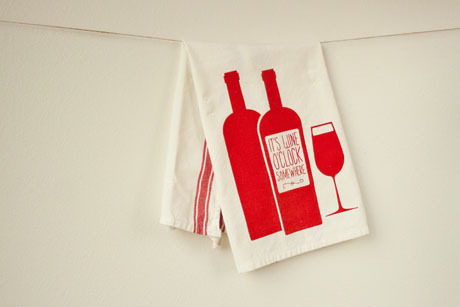 these tea towels are the results of my learning to silk screen this summer and have been available at my booth the last few craft show/street fairs that I have been at. 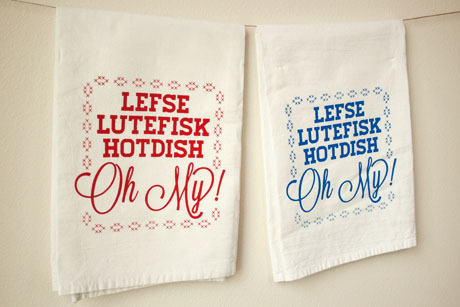 They are now available in my shop. 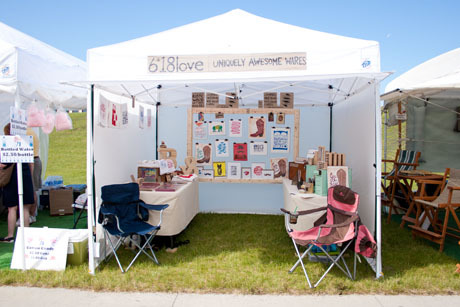 over a month ago I participated in the Grand Cities Artfest—my first ever outdoor show. I learned a lot about dealing with the weather. It was hot, 95+ and humid. We had wind. Not just a nice breeze, but a hold-on-to-your-tent-poles-wind. And we had rain, when it came time to tear down our booth. Jason was wonderful company, my banker, and a great help with set-up and tear down. We met a lot of new people, reconnected with friends and family still in the Grand Forks area and ate cotton candy (how could you not with the stand right next door). Long story short, it took 7 years to finally plant my garden and today I harvested my first salad. 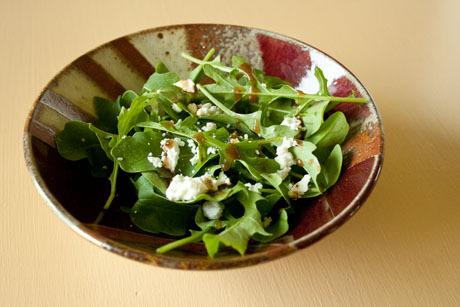 I added a bit of goat cheese and balsamic vinaigrette. It was yummy. I am looking forward to what else I may receive from my little garden. ok. Keeping a blog takes some work and I often times find this activity falling to the bottom of the list of things to do. So after more than a month I am finally getting back to posting something and I resolve to do this more often. Let’s hope I can make it stick. I wanted to share a couple of things that I have worked on. 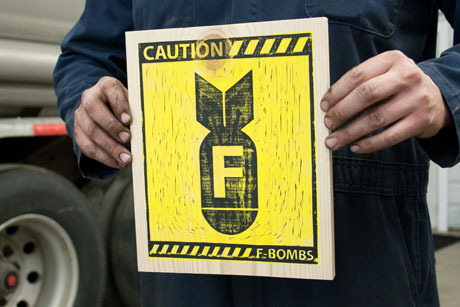 The first is, I decided to make my “Caution F- Bombs” linocut print into a wood sign. I wanted this sign to be more convenient for people to hang in their man cave, garage, or office and I feel having it as a wood sign with a hook for hanging makes this sign more user-friendly. 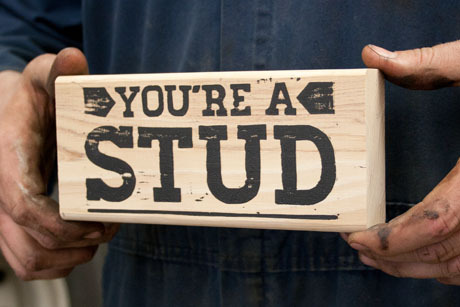 Secondly, I had brainstormed a humors card for someone to give to their man and what that card ended up being was the “You’re A Stud” wood stud card. I had this new wood card available at the Grand Cities Artfest, a few weeks ago and enjoyed see people’s reactions—ranging from a good chuckle to some eye-rolls.